A customer came into the shop yesterday with a Mavic Ksyrium SL front wheel. It’s a second generation, circa 2002-2005, the black one that first had the machining in between the spokes. It’s in excellent shape, except for the broken spoke. In my memory, the first generation production of the Ksyirums had spoke failures a little too frequently for my tastes, but Mavic seemed to have largely overcome that in the later models. Even so, there is nothing terribly surprising about a decade old wheel popping a spoke. Then the customer explained that when he and his wife were moving to a new place in town about 8-9 years before, they had temporarily stored a bunch of stuff at his mother’s property, including his titanium Davidson bike. At the end of winter when he came to retrieve all the things for the new place, the front wheel was thoroughly encrusted with “yellow crystals”. Apparently, there was a resident cat that for whatever reason decided that the Davidson bike, specifically that wheel on the bike, was going to be its personal toilet all winter long. 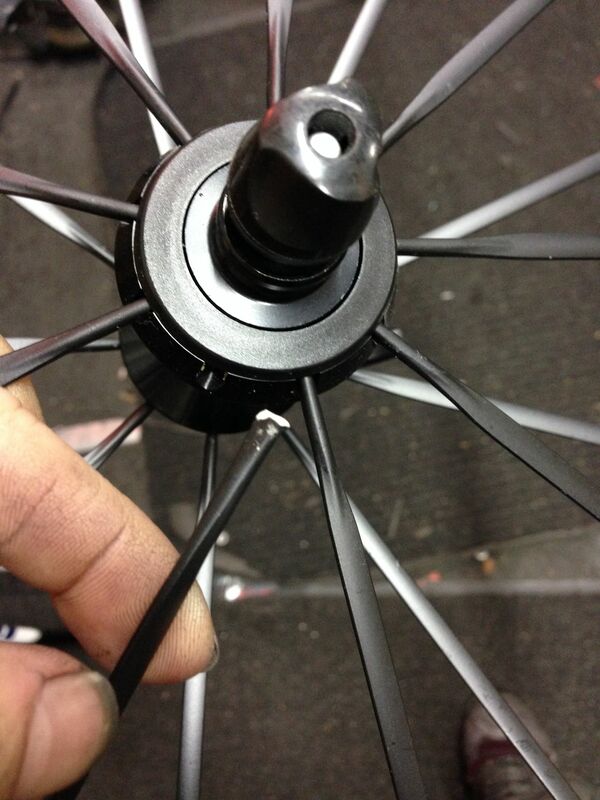 The customer wondered if that had weakened the metal of the spokes.